Plasmodesmata are small passages in the cell walls that make possible the exchange of small molecules between cytoplasms of neighboring cells. They are the main communication pathway between plant cell, particularly in those regions far from the vascular bundles, and are the most common way of molecule exchange between plant cells. Actually, only some highly specialized cells and cell during the differentiation periods have the plasmodesmata pathway very reduced of even closed. Most plasmodesmata are straight channels (Figure 1), but more complex morpholgies, like branched plasmodesmata, can be found. The diameter of the channel is about 30 nm and the length about 100 nm. 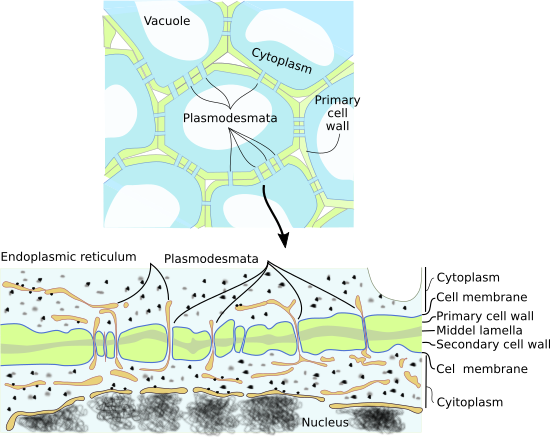 In land plants, plasmodesmata have two regions: the entrance pores and the inner part of the channel, and three components: plasma membrane, endoplasmic reticulum and cytosol. Plasma membrane lines the inner surface of the channel, the tunnel in the cell wall, so that the plasma membrane of the two cells are continuous. Its molecular composition is different from the other regions of the cell plasma membrane. Endoplasmic reticulum cisterns, known as desmotubule, are compressed and located in the inner part of the channel. They are continuous with the endoplasmic reticulum cisterns of the cytoplasm. Cytosol fills the space between the cell membrane and the desmotubule. Actin filaments and myosin have been found in the cytosol in plasmodesmata. Callose is a carbohydrate polymer that usually covers the plasmodesamata entrance at the level of the neck or the entrance border (Figure 2). Figure 1. Plasmodesmata in primary cell wall. A drawing of a transmission electron microscopy image is shown. There are primary and secondary plasmodesmata. Primary plasmodesmata are formed during the cell division y therefore during the formation of the cell wall. Secondary plasmodesmata are formed after the cell wall is synthesized. Secondary plasmodesmata are important for communication between cells of different cell lineages, like vascular and parenchyma cells, or like epimermal and parenchima cells. Plasmodesmata are needed for molecular transport between plant cells, and to control the flux of substances from and toward the vascular cells. For example, water, carbohydrates, hormones, proteins and RNAs (messenger RNAs included) can travel to the phloem from the sources, like parenchyma cells doing photosynthesis, through plasmodesmata. However, virus can also be spread inside the plant tissues in the same way. Molecules smaller than 70 kDa can freely cross plasmodesmata by passive diffusion. This tipe of movement inside of the cytoplasm of cells is known as symplastic (cytoplasms are connected by plasmodesmata). The extracellular space, included the cell wall, is called apoplast and diffusion in this space is known as the apoplastic pathway. 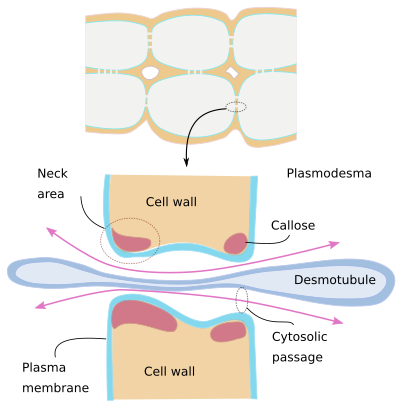 The exchange of molecules through plasmodesmata is so intense that those molecules that have a function in a cell, but not in the others, need to be retained in that cell to prevent the diffusion through plasmodesmata. For example, molecules can be larger than the channel, or they get anchored to cell structures or are included in organelles. If a plant cell wants to have a differential expression pattern, it must minimize the communication through plasmodesmata. This actually happens during morphogenesis, flower development and during the formation of lateral roots. In apical meristems, the cell lineages are determined by the position of the precursor cell in the meristem, so the control of the communication between neighbour cells is crucial for adquirying a particular identity. Furthermore, plasmodesmata are important for the auxin grandients, which are necessary for the proper development of many plant structures. Plasmodesmata influence those gradients by regulating the diffusion rate through their inner space. Callosa deposition in the channel entrance is a mechanism to reduce the diameter of the plasmodesmata channel and therefore the diffusion rate. The accumulation of callosa is a very fast physiologically controlled mechanism, about minutes. Callosa is also removed from plasmodesmata if needed. Plants are able to close the plasmodesmata passages when the communication between neighboring cells may be harmful. For example, when there is an infection or tissue damage. The initial response is closing the plasmodesmata passage with callose deposit. Callose is synthesized induced by bacteria and fungi proteins. Currently, plasmodesmata are also regarded as signaling centers because several protein types, some of them thought to work as receptors, are found either in the desmotubule membranes or in the plasma membrane lining the plasmodesmata passage. Some of these proteins are involved in plant defense responses, others in callosa deposition, and some in cell differentiation. During evolution, plasmodesmata have been independently invented by algae and plants that had parenchyma, with cells that could divide in the 3 spatial directions and had cell walls. Brunkard JO, Zambryski PC. 2017. Plasmodesmata enable multicellularity: new insights into their evolution, biogenesis, and functions in development and immunity. Current opinion in plant biology. 35:76-83.